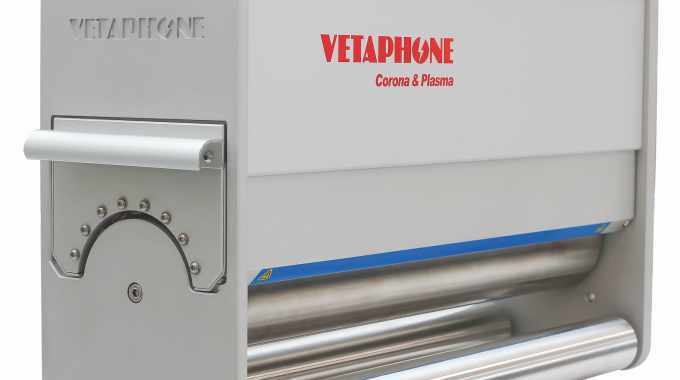 Surface treatment specialist Vetaphone has developed C8, a new corona treatment station designed for substrates and applications where high corona power is required from a single unit. The C8 unit is fitted with eight high-power and high-efficiency ceramic electrodes, allowing more corona power to be discharged from a compact modular system. Having eight electrodes in the unit means the C8 can apply high power corona at high running speeds. Available in web widths from 362mm (14.25in) to 572mm (22.5in) and capable of treating at speeds in excess of 300m/min (985ft/min), the new C8 corona treater is both CE and UL approved. C8 has a robust design for an enhanced maintenance-friendly design, in addition to being fully corrosion proof. Vetaphone noted that C8 has already found a market in the digital printing sector, where its compact efficiency is adding to productivity.